The source rock geochemistry findings reported for this Study incorporate both legacy and newly-generated data for Utica/Point Pleasant and equivalent samples collected in the basin, and include evaluations of organic matter content, quality and thermal maturity. The research team performed TOC analyses, reviewed legacy RockEval data, evaluated organic petrography and performed reflectance and conodont alteration index (CAI) analyses to assess the thermal maturity of these reservoir rocks. In order to analyze the potential for hydrocarbon production from Late Ordovician strata within the Study area, well cuttings and core samples were analyzed to assess their TOC content. TOC values greater than 1% are interpreted to have the potential for hydrocarbon production, presuming that adequate thermal maturation has occurred (Jarvie, 1991). TC on the LECO SC 144 analyzer consisted of weighing between 100 and 400 milligrams (mg) of sample into a sample boat. The sample was combusted at a temperature of 1350°C. The instrument utilizes an Infrared (IR) detector/cell that is calibrated against known reference standards. At that temperature, all forms of carbon are released and detected in gas stream by the IR cell. TIC on the UIC coulometer consisted of weighing between 50 and 300 mg of the sample into a glass vial. Carbon dioxide gas evolved by dissolution in acid from carbonates in the sample was swept by a gas stream into a coulometer cell. The coulometer cell is filled with a partially aqueous medium containing ethanolamine and a colorimetric indicator. Carbon dioxide is quantitatively absorbed by the solution and reacts with the ethanolamine to form a strong, titratable acid that causes the indicator color to fade. The titration current automatically turns on and electrically generates base to return the solution to its original color (blue). For wells where insufficient volumes of rock samples were available to accurately perform TOC analysis using the LECO technique (approximately 1 g of well cuttings or core chips), samples were analyzed using a carbon coulometer at NYSM. A total of 703 well cuttings samples too small for the LECO technique at KGS were shipped to the NYSM for analysis. In addition to the TOC analyses completed for this Study, the research team also compiled values from existing TOC datasets for inclusion into the database. Numerous oil and gas companies have sampled Upper Ordovician black shale well cuttings and core from ODGS core repository during the past few years to obtain source rock analyses. These companies are required to provide to ODGS a copy of all analyses, which can be held confidential for one year. Many of these analyses are no longer confidential in status, and are now available for public distribution. Because of this data availability, ODGS was able to donate an additional 3054 Upper Ordovician TOC data points to the Study. NYSM also donated an additional 4652 TOC data points for New York wells (including some shallower data) that were collected for other projects. Including these data, the Study has a total of 368 well locations with TOC data (Figure 7-1). Figure 7-1. Map of wells with TOC data gathered for the Study. As TOC results began to arrive from the laboratory, it became apparent that the organic carbon content of Utica/Point Pleasant and equivalent rocks is not identifiable by visual inspection (i.e., the "darkness" of samples does not correlate to the organic richness of samples). Many dark-colored shaly beds returned lower TOC percentages than relatively light colored, limestone-rich beds within the same well and stratigraphic unit. Consequently, potential source zones for TOC analysis of rock cuttings can be difficult to target, at least from a sampling perspective. Also, because of the interlayered limestone/shale nature of these formations, all of the studied Upper Ordovician units have at least some nonorganic beds. Therefore, if only a few samples are taken per well (or if representative proportions of aggregate cutting sets are not used), false negatives are common, yielding low %TOC values from what is actually an organic-rich unit. This can lead to confusing, "bullseye" heavy maps of TOC value when contoured on raw measured data (or even averaged) values alone. In order to present TOC variability in the most realistic and practical manner, we chose a methodology that displays the highest %TOC encountered in each well at each of the studied horizons. Even so, many of the organic-rich beds (within a larger stratigraphic unit) were quite thin. To account for vertical variations in organic carbon, wells with more than 25 ft of greater than 1% TOC values were highlighted. By using this combination of symbologies, the areas with the highest overall organic content for each unit are easily identified. In the following figures, the maximum TOC value from each well within the specified formation is indicated by colored circles, overlain on generalized isopach grids (darker = thicker). Wells with maximum %TOC values for each stratigraphic unit less than 1% are highlighted in white, 1-2% (source rock threshold) are in yellow, 2-4% are light orange, and values over 4% are in dark orange. Wells with more than 25 ft of sampled strata and with TOC values greater than 1% are highlighted by smaller red circles. Figure 7-2. Map of maximum TOC (%) measured in the Kope Formation. See text for explanation of symbols and colors. Figure 7-3. Map of maximum TOC (%) measured in the Utica Shale. See text for explanation of symbols and colors. Figure 7-4. Map of maximum TOC (%) measured in the Point Pleasant Formation. See text for explanation of symbols and colors. Figure 7-5. Map of maximum TOC (%) measured in the upper Lexington/Trenton Formation interval. See text for explanation of symbols and colors. Figure 7-6. Map of maximum TOC (%) measured in the Logana Member of the Lexington/Trenton Formation. See text for explanation of symbols and colors. Figure 7-7. Map of maximum TOC (%) measured in the Curdsville Member of the Lexington/Trenton Formation. See text for explanation of symbols and colors. Sampling and analysis for TOC can be time-consuming and raises costs for hydrocarbon source and reservoir characterization efforts. 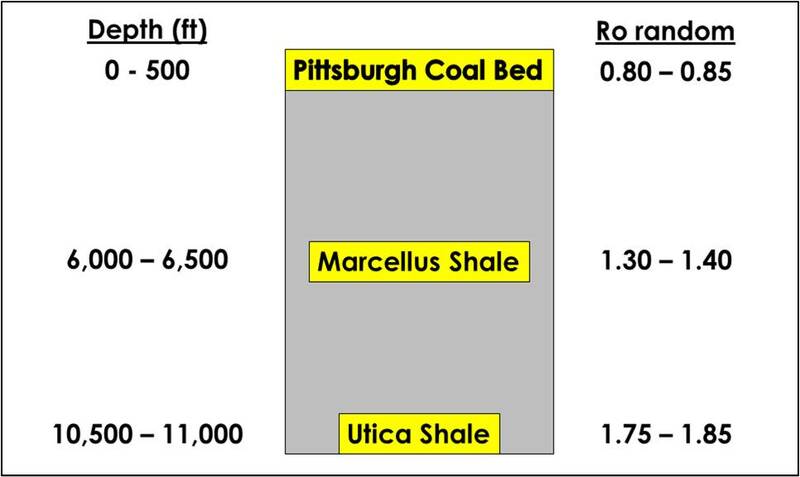 Once the regional TOC data had been compiled for the studied units, numerous data comparisons and crossplots were made in the hopes that a more efficient indicator of TOC could be defined for the Utica Shale play. The one commonly recorded parameter that appears to correlate with TOC abundance is the RHOB log. Although the TOC sampling methods produced some scatter on the crossplots (Figures 7-8 through 7-13), subjective analysis of individual density logs appears to be a reliable method of predicting TOC within the mature region of the play. This correlation appears to be the strongest within the upper Lexington/Trenton Formation and Logana Member, and with slightly less correlation within the more shale-rich Point Pleasant Formation and Utica Shale. The Kope Formation and Curdsville Member displayed little to no correlation between RHOB and TOC. Figure 7-8. 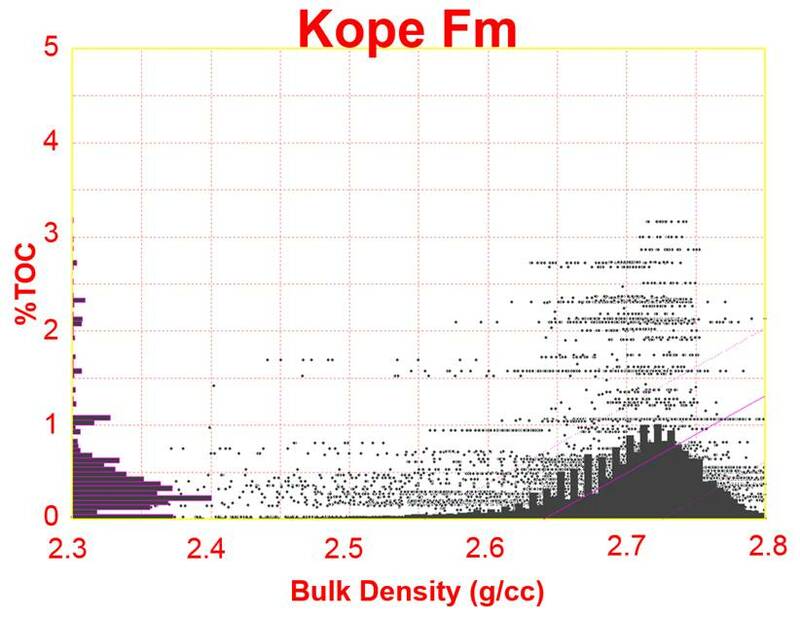 Crossplot of RHOB log value vs. sampled %TOC for the Kope Formation. Figure 7-9. 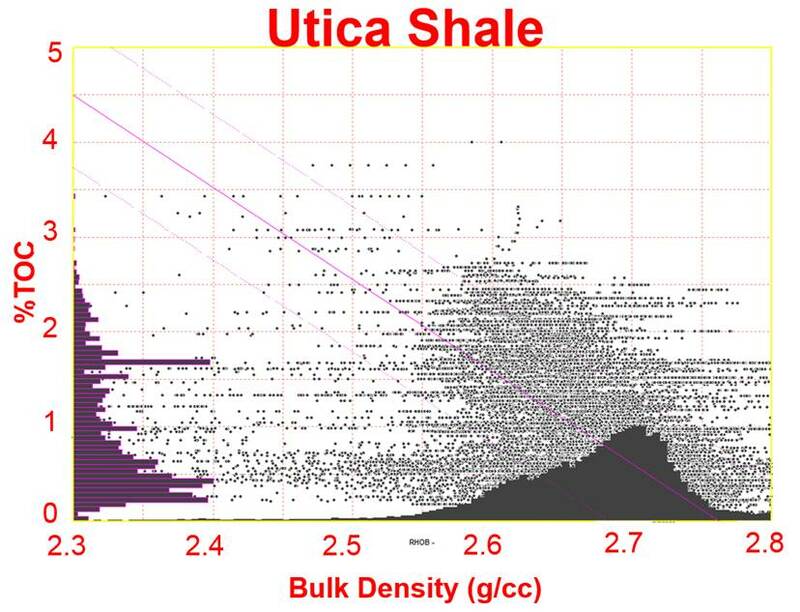 Crossplot of RHOB log value vs. sampled %TOC for the Utica Shale. Figure 7-10. Crossplot of RHOB log value vs. sampled %TOC for the Point Pleasant Formation. Figure 7-11. Crossplot of RHOB log value vs. sampled %TOC for the upper Lexington/Trenton Formation. Figure 7-12. Crossplot of RHOB log value vs. sampled %TOC for the Logana Member of the Lexington/Trenton Formation. Figure 7-13. Crossplot of RHOB log value vs. sampled %TOC for the Curdsville Member of the Lexington/Trenton Formation. As part of the compilation of preexisting data for this project, ODGS provided results for 1900 RockEval analyses of Upper Ordovician strata from their sample record inventory. The original scope of this Study included funds for additional RockEval laboratory analyses to augment this existing Ohio dataset. After thorough examination of the legacy data, however, it became apparent that there was a high degree of variability in the RockEval results. This variability was noted both between adjacent wells and even within the same unit of individual wells. The variation appears to be the result of weak or poorly defined S2 peaks on the pyrolysis curves for these units. Whether this is due to the oxidation of older cuttings samples (Peters, 1986), or it is just the nature of the specific organic material within these units, is unclear. 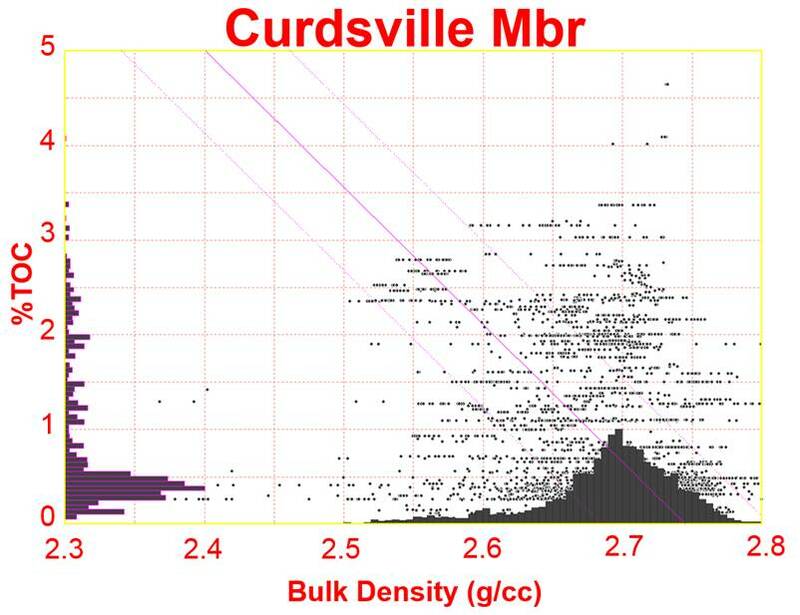 Thermal maturity analyses of bitumen reflectance, as performed by Cortland Eble of KGS (see Section 7.3), were both internally consistent and roughly matched expected maturities based upon the fluid content (oil, wet gas, dry gas, etc.) from initial production reports in the eastern Ohio Utica Play area. Based on these results, the research team decided that the Study would benefit more from additional reflectance analyses, rather than more RockEval tests, so the project budget and scope was modified to reflect this change in focus. KGS obtained Utica/Point Pleasant samples from Kentucky, Ohio and Pennsylvania exploration wells and examined them petrographically in reflected light to obtain reflectance measurement data (Ro). Of the approximately 350 samples that were prepared and examined, 90 had sufficient bitumen for reflectance analysis, and are discussed herein. Samples from Kentucky and Ohio consisted of core cuttings and core pieces. Samples from Pennsylvania consisted of rock cuttings that had been previously reduced in size to -60 mesh (250 μm maximum particle size). All samples were mixed with epoxy resin and placed into 2.5-, 3.2-, or 3.8-cm diameter phenolic ring form molds, depending on the size of the material. After curing, the samples were ground and polished using 320, 400 and 600 grit papers, 1.0, 0.03 and 0.05 μm alumina slurries, and 0.05-μm colloidal silica. Polished samples were air-dried and placed in a desiccator prior to analysis. Reflected light analysis was performed on a Zeiss UEM microscope, with a Zeiss epiplan 40X oil immersion objective, and a Hamamastu R928 photomultiplier. The light source for the analysis was supplied by an Osram Xenophot HLX 12V, 100W bulb; Zeiss Immersol oil was used (ne = 1.518, ve = 42). Random reflectance (Ro random) measurements were collected by first calibrating the system using a glass standard of known reflectance. Following this, reflectance measurements were collected particles of bitumen, using a 2-μm diameter measuring spot. In most cases, 30 to 40 measurements were taken for each sample, though this depended on the abundance of bitumen. In some samples, fewer than 30 particles could be identified and measured. The average, maximum, minimum, standard deviation and number of measurements were recorded for each sample. Fluorescent light was used to assist in the identification of organic components. A Lumen Dynamics 120-watt high pressure metal halide arc lamp was used in conjunction with a Zeiss 09 filter set (450-490 nanometer [nm] excitation, 510 nm beam splitter and 515 nm emission filters). This particular light/filter configuration makes the liptinitic portion of the organic material fluoresce yellow, orange or red, depending on the level of thermal maturity. Samples with elevated (>2.0 %) TOC contents typically had the most abundant bitumen. Two principle types of bitumen were observed in the samples – grahamite and epi-impsonite, according to the genetic classification of solid bitumen developed by Jacob (1976). Particles of epi-impsonite were selected for measurement, as they had very smooth surfaces. Particles identified as grahamite had coarse-textured surfaces with lower reflectance. It is probable that some fragments of graptolites were also measured, especially as the typical particle size of the bitumen particles was <10 μm. Bitumen was found to be a minor organic component in these samples. Instead, amorphous organic matter, referred to as amorphinite (Senftle and others, 1987) in this text, is by far the dominant (<75%, mineral matter free) organic component of nearly all of the samples. Amorphinite appears as an organic coating on (mainly) clay grains, and is identified principally by fluorescence. In lower rank samples (Ro 0.6-0.8%), it has a yellow fluorescence, changing to orange and red in higher rank samples (Ro 1.0-1.5%). It cannot be seen in very high rank samples (Ro >1.5%), as fluorescence becomes negligible, and finally disappears. The association of well-preserved organic material in fine-grained sediments has been discussed by MacQuaker and others (2010). Organic material is enhanced through entombment in a shale-dominant mineral matrix, which protects and preserves the organic material in an otherwise oxygen-rich depositional environment. Carbonate minerals (mainly calcite) dominate the inorganic matrix of most samples. Occasionally, grains of calcite were observed to fluoresce brightly. Although the cause of this is unclear, it is possible that these grains may have been impregnated with liquid hydrocarbons (paraffinic oils?). Examples of the types of organic material identified from Utica and equivalent samples are provided in Appendix 7-A (PDF, 952 KB; 11 pages). Ro random reflectance measurements collected for the Study ranged from 0.66% to 2.2%, indicating thermal maturity levels from early oil generation to catagenic gas (Dow, 1977; Figure 7-14). Figure 7-14. 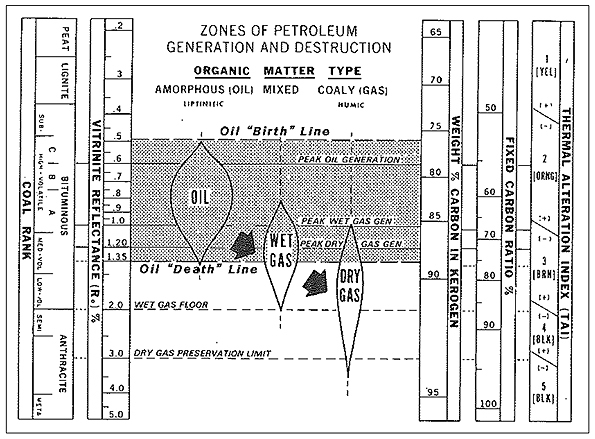 Petroleum generation chart, showing the ranges of oil, wet gas and dry gas generation (from Dow, 1977). This calculation approximates the Ro maximum measurement that would be obtained by using polarized light, and rotating the stage to obtain a maximum and minimum value, as is a common practice in coal petrology. Samples from Kentucky were obtained from two boreholes – C-361 from Pulaski County in south-central Kentucky, and C-139 from Boone County in northern Kentucky (Figure 7-15). The organic-rich sections of these cores were few in number, but contained very abundant and large pieces of bitumen. Ro random values of 0.74 and 0.76% for C-139 and C-361, respectively, indicating thermal maturity levels in the lower to middle part of the oil window (Table 7-1). Figure 7-15. Map of Kentucky showing locations of core samples. Average Ro random values for each core are shown in red type. Table 7-1. Reflectance data for Kentucky samples. 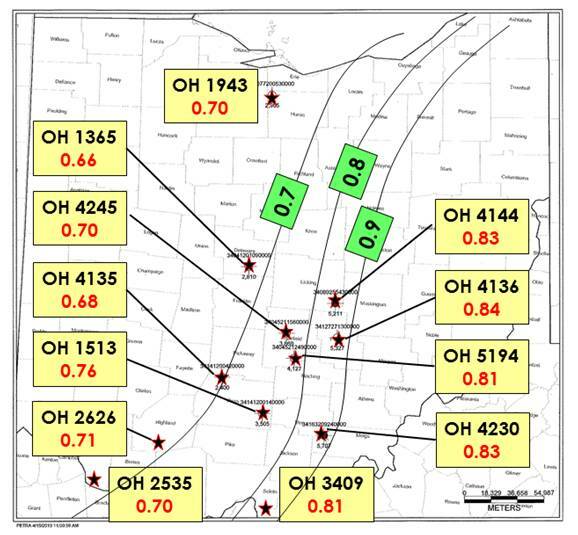 Samples from 12 borehole locations in central Ohio (Figure 7-16) were analyzed. 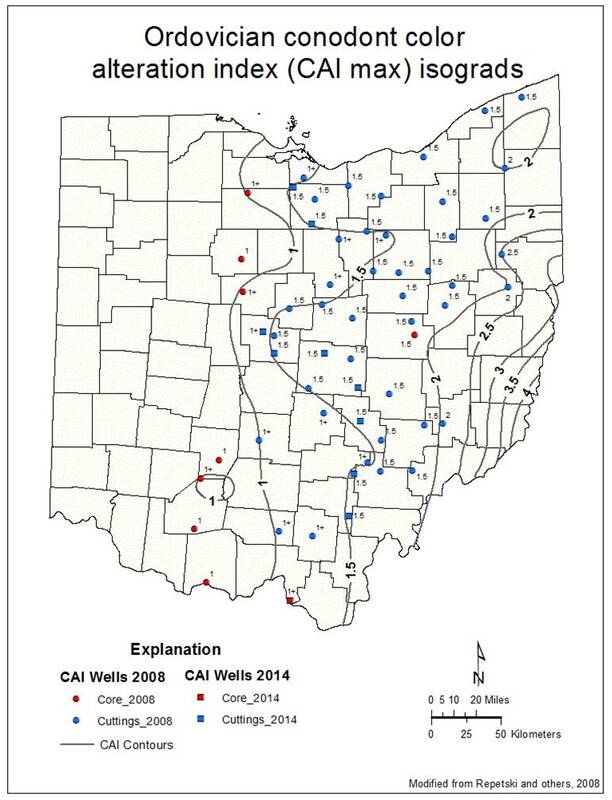 Boreholes along the western margin of the central Ohio area reported reflectance values from 0.66 to 0.71%. Borehole locations in the more central and eastern part of this area had reflectance values of 0.76 to 0.84% (Table 7-2). Collectively, the Utica/Point Pleasant in the central Ohio area has a level of thermal maturity in the lower to middle part of the oil window. Figure 7-16. Map of Ohio showing locations of core samples. Average Ro random values for each core are shown in red type. Table 7-2. Reflectance data for central Ohio samples. 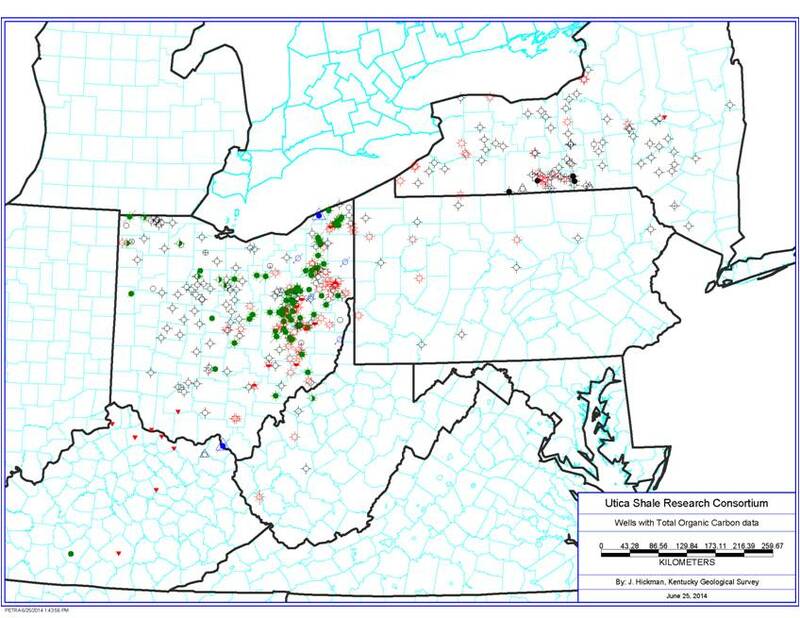 Samples from 15 borehole locations in eastern Ohio (Figure 7-17) also were analyzed. Bitumen reflectance increases rapidly from 0.94% in the westernmost part of this area (location 5483, Wayne County) to 1.43% in the easternmost part of this area (location 5434 in Jefferson County, Table 7-3). 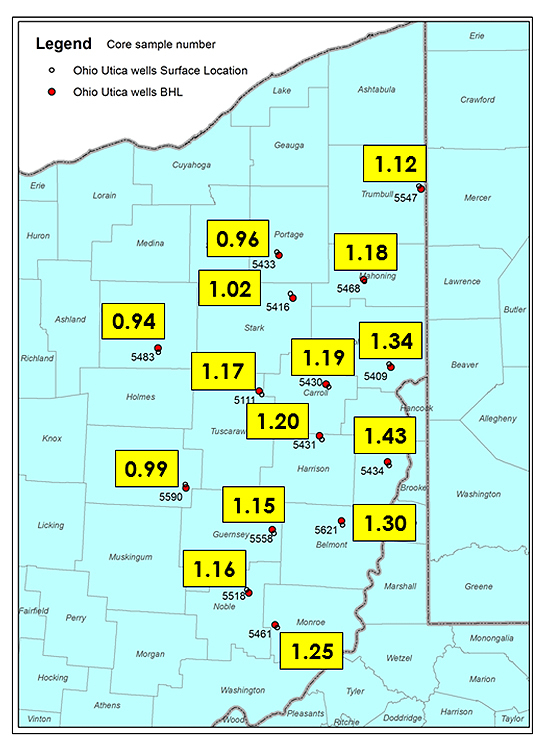 Collectively, the Utica/Point Pleasant in eastern Ohio has a level of thermal maturity that includes the middle and upper portions of the oil window, the wet gas window and the lower part of the dry gas window. Figure 7-17. Map of eastern Ohio showing locations of core samples. Average Ro random values for each core are shown in in the yellow shaded boxes beside the core location points. Table 7-3. Reflectance data for northeastern Ohio samples. Rock cuttings samples from four wells located in western Pennsylvania (Figure 7-18) were analyzed. Samples from the Kardosh No. 1 in Crawford County were the most thermally immature, with an average Ro random of 1.08%. Samples from the Martin No. 1 in Armstrong County were the most thermally mature, with an average Ro random of 2.19%. Samples from the Starvaggi No. 1 in Washington County, at a depth from 10,610 to 10,840 ft, had an average Ro random of 1.79%. Collectively, the Utica/Point Pleasant in western Pennsylvania has a level of thermal maturity that ranges from the upper part of the oil window to the top of the dry gas window (Table 7-4). Figure 7-18. Map of Pennsylvania showing locations of well cuttings samples. Average Ro random values for each location are shown in red type. Table 7-4. Reflectance data for Pennsylvania samples. A sample of the geologically younger Marcellus Formation from Washington County (API# 3712520552), located at a depth of 6450 ft, also was analyzed for comparison purposes. This sample reported a Ro random value of 1.39%. In addition, the Pittsburgh coal bed, which occurs within 500 ft of ground surface across Washington County, has an Ro random of 0.8 to 0.85% (Ruppert and others, 2010). 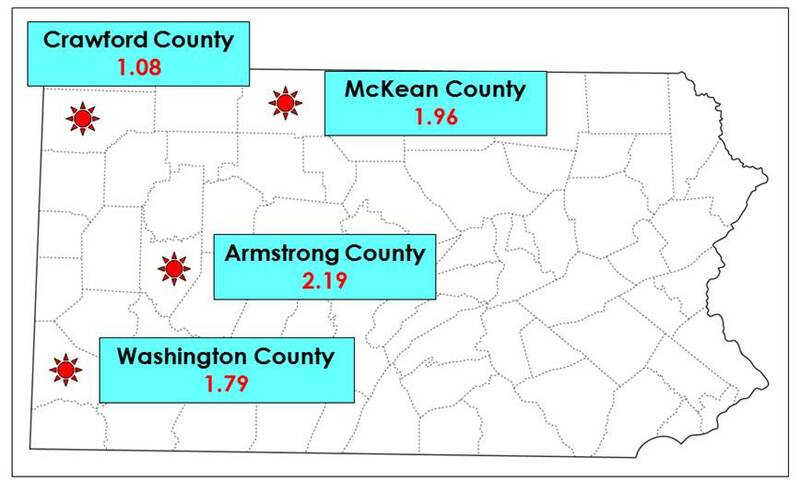 Collectively, this indicates a random reflectance increase of about 1.0% over a depth range of about 10,000 ft in southwestern Pennsylvania (Figure 7-19). Figure 7-19. Reflectance measurements for discrete depth intervals in Washington County, Pennsylvania, showing a change of approximately 1.0% Ro over a depth of about 10,000 ft. The organic matter composition of the Utica/Point Pleasant is uniformly dominated by amorphinite, which indicates an algal source for much, if not most, of the organic material in the rocks. Organic-rich intervals within the Utica/Point Pleasant have a greater proportion of shale in the inorganic matrix, with the organic material occurring most frequently in association with shale lithologies. Organic-poor intervals are usually carbonate-mineral dominant. The level of thermal maturity in the Utica/Point Pleasant shows a progression in increasing bitumen reflectance from west to east, with a very steep increase occurring in eastern Ohio. This is mainly the result of a rapid increase in depth of the Utica/Point Pleasant in this area. In central Ohio, the Utica/Point Pleasant was sampled at depths from less than 100 ft in Clermont County (OH2535) to about 4800 ft in Vinton County (OH4230). Ro random values from central Ohio ranged from 0.66 to 0.84%. 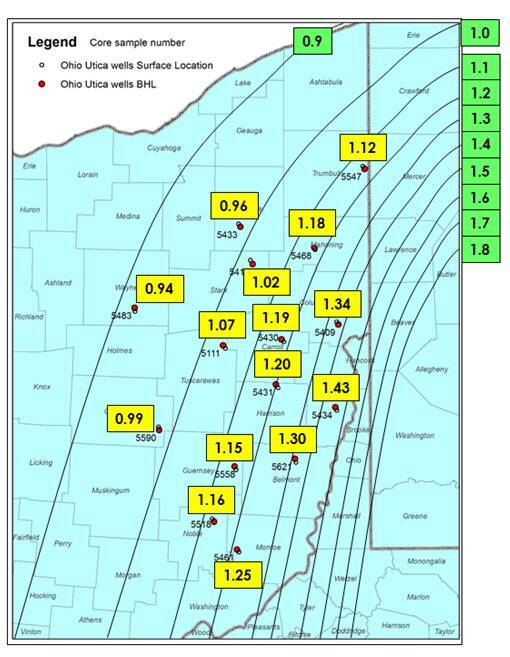 In eastern Ohio, sample depths ranged from 8700 ft to more than 15,000 ft, with Ro values ranging from 0.94 to 1.43%. As such, it is not surprising that the eastern Ohio area is more thermally mature. Two thermal maturity maps with isoreflectance lines (one for central Ohio and another for eastern Ohio) are provided in Figures 7-20 and 7-21, respectively. These agree well with a previously published map for this area of the basin (ODNR, 2013). Figure 7-20. Map of eastern Ohio showing isoreflectance lines. Figure 7-21. Map of Ohio showing isoreflectance lines for the central part of the state. This particular task builds on work previously conducted by Cooney (2013) regarding thermal maturity trends of the Utica Shale Play in Pennsylvania. Cooney (2013) (see Appendix 7-B (PDF, 3.41 MB; 95 pages)) found that although mineralogy varied significantly between the Utica and Point Pleasant formations (higher carbonate in the Point Pleasant versus higher quartz and clay in the Utica), reflectance measurements collected for each interval remained very similar at most locations and did not necessarily increase with depth. Reflectance values did increase from west to east across Pennsylvania, which agrees with earlier thermal maturity studies. Since composite samples were taken in 50-ft intervals, they did not necessarily reflect small-scale variations in organic-richness that may be present within each formation, and thus, a much more detailed sample set, with formations sampled every 10 ft, was warranted for this follow-on work. For the current task, the research team explored potential relationships among Utica and Point Pleasant mineralogy, organic content and bitumen reflectance, as well as potential trends among these parameters with well depth. Samples were collected from several wells across Pennsylvania, where thermal maturity has been shown to span from the oil window through the dry gas window. Samples from several wells penetrating the Utica/Point Pleasant were collected from the PAGS rock cuttings repository for this work. In an initial study by Cooney (2013), rock cuttings from six different wells were sampled at 50-ft intervals from the top, middle and base of the Kope, Utica and Point Pleasant formations, where present (Table 7-6). Shale samples (3 to 5 g each) were collected every 10 ft along each 50-ft sampling interval, and then composited to make one representative sample for that interval. For the current Study, five additional well locations were chosen for analysis, and one well from the initial study was reexamined (Figure 7-22). For these locations, rock cuttings were sampled every 10 ft from the inorganic shale just above the Utica (i.e., Kope Formation) to the Lexington/Trenton Formation below the base of the Utica/Point Pleasant (Table 7-5). Table 7-5. Summary of sampling intervals for preliminary work conducted by Cooney (2013) and those of the current Study. Figure 7-22. Map of Pennsylvania showing sample locations utilized by Cooney (2013) in a preliminary study of Utica/Point Pleasant thermal maturity (black circles), and those used in the current Study (red triangles). Each sample was ground with a mortar and pestle and sieved through a #16 sieve. Approximately 2 g of sample were added to roughly 3 g of Beuhler TransOptic powder (20-3400-080) and mixed. The sample and powder were then placed into a Beuhler Simplimet 3000 Automatic Mounting Press and run for 15.5 minutes at 4000 pounds per square inch (psi) to form solid sample plugs for reflectance analysis. After sitting overnight in a desiccator, the plugs were polished using a Beuhler Ecomet 300 and six polishing pads of varying coarseness. Each plug was analyzed using a Leica DMRX microscope which was calibrated using a (YAG) [0.901] or (GGG) [1.719] standard with MSP200V4.3 and AxioVision software. Using immersion oil and an oil objective, samples were visually assessed for bitumen using the American Society for Testing and Materials (ASTM) standard D2797. As many measurements as possible were made on macerals of sufficient size. 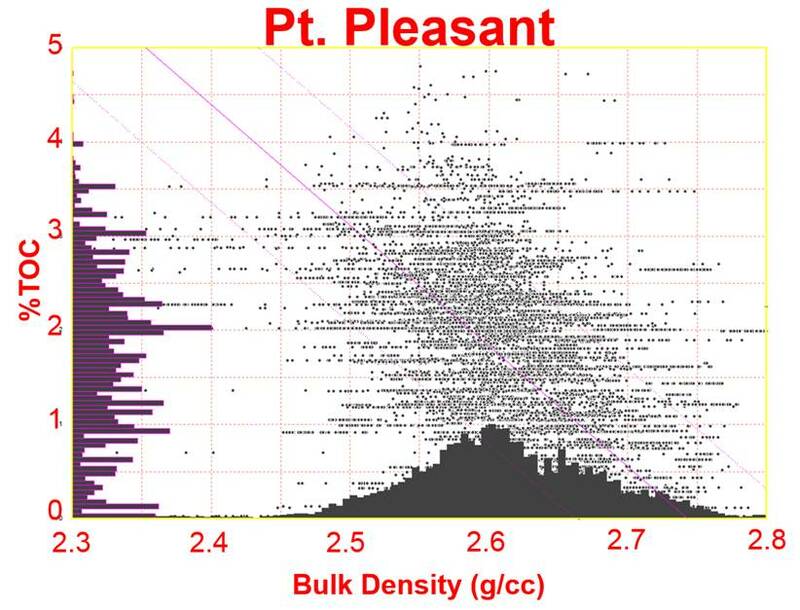 Using the ASTM 7708 template, data were placed into a histogram that included three category divisions: coked bitumen, degraded bitumen, and homogeneous bitumen. The resulting data are provided in Appendix 7-C (PDF, 4.38 MB; 171 pages). Click on header below to expand results for listed well/bore. Bitumen reflectance samples were collected from the PA Dept. of Forests & Waters Block 2 No. 1 well in Erie County, Pennsylvania, over a 295-ft depth range, spanning from the Kope Formation through the upper portion of the Trenton/Lexington Formation (Table 7-6). Reflectance measurements could not be made for many of these intervals due to lack of bitumen and/or insufficient maceral size. In those intervals where bitumen was present, the number of observations made was limited (Table 7-6). Table 7-6. Mineralogy, TOC and Reflectance Data for PA Dept. of Forest & Waters Block 2 No. 1. In general, reflectance increases with depth, with a cluster of relatively high measurements (1.5-2.0% BRo) reported near the base of the Utica Shale (3895 ft) through the top of the Lexington/Trenton Formation (4010 ft). This notable increase in measured reflectance values in the lower Utica occurs about 50 ft shallower than any changes in mineralogy (Table 7-6). The Point Pleasant Formation is not present in this area of Pennsylvania, so the Utica and Lexington/Trenton formations are in direct, disconformable contact with one another at this location. Figure 7-23. Crossplot of mean reflectance measurements (BRo%) versus depth in the PA Dept. of Forests & Waters Block 2 No. 1 well, Erie County, Pennsylvania. Reflectance generally increases with depth. A tabular summary of the mean bitumen reflectance values (by formation) is provided in Table 7-7. The mean BRo measured in this well is 1.38%. Table 7-7. Mean reflectance (BRo%) by formation, PA Dept. of Forests & Waters Block 2 No. 1. Bitumen reflectance samples were collected from the Shaw No. 1 well in Warren County, Pennsylvania, over a 315-ft range spanning from the Utica Shale through the upper Lexington/Trenton Formation (Figure 7-24). The number of reflectance measurements that could be made was limited, but macerals of measureable size were more abundant in this well than in samples collected from PA Dept. of Forest & Waters Block No. 1 in neighboring Erie County. In general, intervals of high and low reflectance were found in all three formations. The most measureable macerals occurred at the bottom of the Point Pleasant Formation (8300 to 8375 ft), directly on top of the Lexington/Trenton Formation, which alludes to a relatively organic-rich zone in this part of the interval. A similar cluster of relatively higher N values is found at the bottom of the Utica Shale and into the top of the Point Pleasant. There does not appear to be any correlation between intervals of higher reflectance and mineralogical variations (Table 7-8). Even so, where the highest number of measureable macerals were encountered (i.e., at the base of the Utica and Point Pleasant formations), a noticeable change in mineralogy takes place (increasing carbonate, decreasing clay). Overall, reflectance increases with depth (Table 7-8). Table 7-8. Mineralogy, TOC and Reflectance Data for Shaw No. 1. 1 – TOC samples were taken from this well in 50-ft intervals by Cooney (2013). TOC results were as follows: 0.20% at 7600-7650 ft (Kope Formation); 1.20% at 8100-8150 ft (Utica Shale); and 1.54% at 8250-8300 ft (Point Pleasant Formation). Figure 7-24. Crossplot of mean reflectance measurements (BRo%) versus depth in the Shaw No. 1 well, Warren County, Pennsylvania. Many BRo values fall in the 1.5 to 2.0% range, regardless of formation or depth. A tabular summary of the mean bitumen reflectance values (by formation) is provided in Table 7-9. The mean BRo measured in this well is 1.72%. Table 7-9. Mean reflectance (BRo%) by formation, Shaw No. 1. Bitumen reflectance measurements were collected from the Starvaggi No. 1 well in Washington County, Pennsylvania, over a 970-ft range that included multiple formations: the Kope, Utica, Point Pleasant and Lexington/Trenton. Generally, intervals of high reflectance are found at various depths throughout the well, but intervals with the highest numbers of measureable macerals were found in the lower Utica Shale and interspersed throughout the Point Pleasant Formation (Table 7-10). Elevated TOC values are coincident with sample intervals having the largest number of maceral observations. Table 7-10. Mineralogy, TOC and Reflectance Data for Starvaggi No. 1. 1 – BRo measurements reported for this well are suspect, based on review of other measurements prepared by this Study. See Section 7.3.5.3 below. Figure 7-25. Crossplot of mean reflectance measurements (BRo%) versus depth in the Starvaggi No. 1 well, Washington County, Pennsylvania. 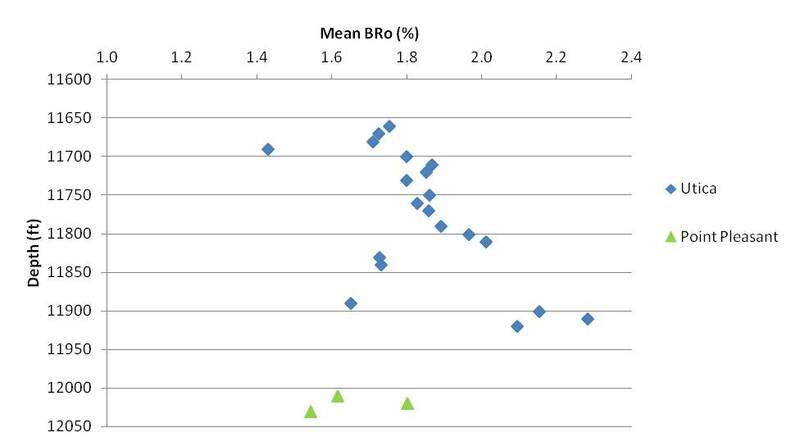 Many BRo values fall in the 0.8 to 1.2% range, regardless of formation or depth. A tabular summary of the mean bitumen reflectance values (by formation) is provided in Table 7-11. The mean BRo measured in this well is 1.01%. Table 7-11. Mean reflectance (BRo%) by formation, Starvaggi No. 1. Bitumen reflectance measurements were collected from the Marshlands No. 2 well in Tioga County, Pennsylvania, over a 370-ft interval that includes the Utica Shale and Point Pleasant Formation. Reflectance gradually increases with depth in the Utica Shale, and decreases at the top of the Point Pleasant Formation. The sharp increase in reflectance values in the lower Utica (11,900 ft) directly coincides with a significant change in mineralogy, where carbonate increases and clay and quartz minerals begin to decrease (Table 7-12). Table 7-12. Mineralogy, TOC and Reflectance Data for Marshlands No. 2. Figure 7-26. Crossplot of mean reflectance measurements (BRo%) versus depth in the Marshlands No. 2 well, Tioga County, Pennsylvania. A majority of measurements for both the Utica and Point Pleasant intervals fall in the 1.5 to 2.0% range. A tabular summary of the mean bitumen reflectance values (by formation) is provided in Table 7-13. The mean BRo measured in this well is 1.82%. Table 7-13. Mean reflectance (BRo%) by formation, Marshlands No. 2. Bitumen reflectance measurements were collected from the Shade Mt. No. 1 in Juniata County, Pennsylvania, over a 90-ft depth range comprised exclusively of the Point Pleasant Formation. Some intervals were excluded from analysis due to lack of bitumen macerals and/or insufficient maceral size. In this well, the Point Pleasant Formation exhibits a steady increase in bitumen reflectance with depth (Table 7-14). Table 7-14. Mineralogy, TOC and Reflectance Data for Shade Mt. No. 1. Figure 7-27. Crossplot of mean reflectance measurements (BRo%) versus depth in the Shade Mt. No. 1, Juniata County, Pennsylvania. Reflectance generally increases with depth. A tabular summary of the mean bitumen reflectance values (by formation) is provided in Table 7-15. The mean BRo measured in this well is 0.92%. Table 7-15. Mean reflectance (BRo%) by formation, Shade Mt. No. 1. Bitumen reflectance measurements were collected from the Svetz No. 1 in Somerset County, Pennsylvania, over a depth range of 140 ft comprised exclusively of the Utica Shale. Many of the depth intervals sampled in this well lack reflectance measurements due to an insufficient number of observations (i.e., the number and size of bitumen macerals were limited) (Table 7-16). Reflectance values range from 1.95 to 3.2% BRo, and no particular trends are noted with depth. Table 7-16. Mineralogy, TOC and Reflectance Data for Svetz No. 1. 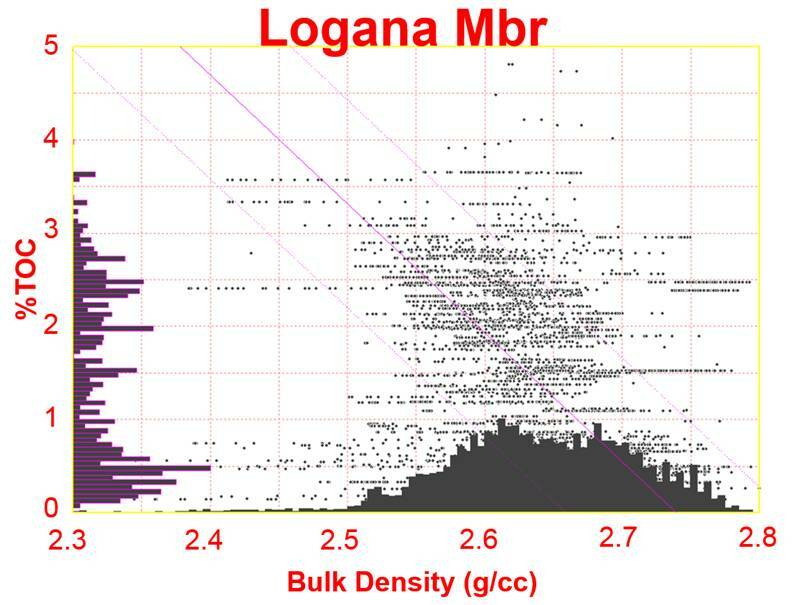 1 – Legacy TOC data reported by Laughrey and others (2009) for sample collected at 14,980-15,040 ft. Figure 7-28. Crossplot of mean reflectance measurements (BRo%) versus depth in the Svetz No. 1 well, Somerset County, Pennsylvania. A tabular summary of the mean bitumen reflectance values (by formation) is provided in Table 7-17. The mean BRo measured in this well is 2.76%. Table 7-17. Mean reflectance (BRo%) by formation, Svetz No. 1. 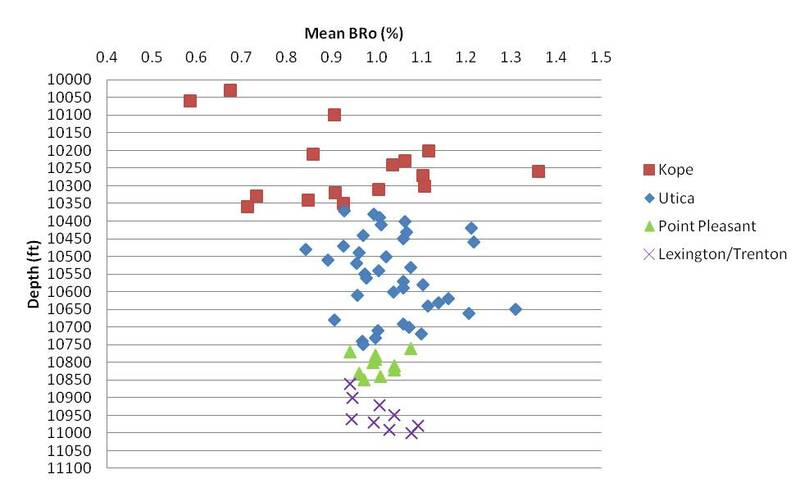 A correlation for transforming bitumen reflectance (BRo) measurements to vitrinite reflectance equivalent (Ro eq) values has yet to be published for the Utica Shale play. In an attempt to address this situation, we have chosen a suite of correlations developed for other organic-rich shales to transform the Pennsylvania BRo data into Ro eq values. We have selected equations by Jacob (1989), Landis and Castaño (1994) and Schoenherr (2007) for this effort. Table 7-19 summarizes the mean bitumen reflectance values (BRo%) for each well, along with representative vitrinite reflectance equivalent values (Ro eq%). An expanded discussion on this topic is provided in Appendix 7-D (PDF, 305 KB; 7 pages). Table 7-18. Conversion of bitumen reflectance (BRo) measurements to vitrinite reflectance equivalent (Ro eq) values utilizing three different methods. Using the correlations of Jacob (1989), Landis and Castaño (1994) and Schoenherr (2007), Ro eq values for the six Pennsylvania wells evaluated for this task range from 1.0 to 2.9% (Table 7-19). The Shade Mt. No. 1 has Ro eq values ranging from 1.0 to 1.2%, which would place it in the oil to early gas window. The PA Dept. of Forests & Waters Block 2 No. 1 (Ro eq – 1.3 to 1.6%), the Shaw No. 1 (Ro eq – 1.5 to 1.9%) and the Marshlands No. 2 (Ro eq – 1.5 to 2.1%) have values that would place these wells in the dry gas window. The Svetz No. 1 has Ro eq values ranging from 2.1 to 2.9%, which would place it in the dry gas to overmature window. Using these correlations on the Starvaggi No. 1 well yields Ro eq values ranging from 1.0 to 1.3% (Table 7-18), which would place it in the peak oil to gas window. However, this particular well (the most recently completed well in this dataset) is known to have produced only dry gas, which is more consistent with reflectance results reported for this location by Cortland Eble (i.e., mean BRo of 1.79% and calculated Ro eq of 1.51%; see Section 7.3.3.3). To address this discrepancy, we have reviewed all bitumen reflectance data collected as part of this current work against those reported by Eble for his Pennsylvania dataset (Section 7.3.3.3), as well as those collected by Cooney (2013). Based on this review, we see consistent well-by-well results (where duplicate analyses were performed) and general agreement in thermal maturity trends across the state for all reflectance data but those of the Starvaggi No. 1. A review of our laboratory log books suggest that the discrepancy observed in BRo (and therefore, Ro eq) values for this particular location may be due to an unsatisfactory calibration of the petrographic microscope at the time the Starvaggi No. 1 samples were analyzed. Excluding the Shade Mt. No. 1 and adjusting the Starvaggi No. 1 to fall within the dry gas window, the calculated Ro eq values and associated Utica thermal maturities increase from west to east in Pennsylvania (Figure 7-29). Although many more data points would be required to delineate specific areas of thermal maturity, this pattern generally fits with previously published thermal maturity maps for the state (e.g., Repetski and others, 2008). This means that moving eastward toward the structural front in central Pennsylvania, one could expect to find more thermally mature rocks, capable of producing natural gas, whereas relatively immature rocks in the northwest may produce oil and/or condensate. Figure 7-29. Map of Pennsylvania showing approximate thermal maturity boundaries for the Utica Shale play, based on Ro eq values calculated as part of this Study. Overall, we observed a general trend of increasing reflectance with depth of formation. 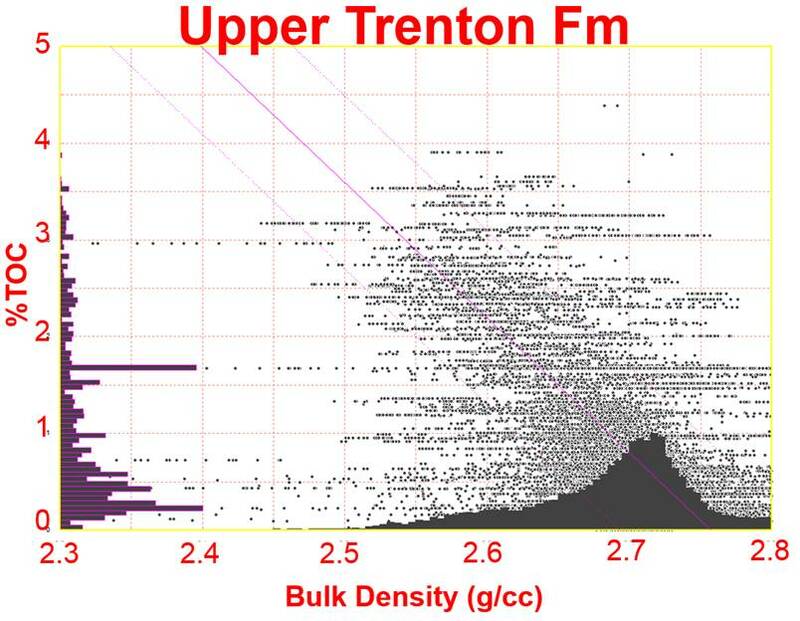 While the relationship between depth and BRo% was not exactly linear, in most cases mean BRo% for each formation increased from the Kope to Utica, Utica to Point Pleasant and Point Pleasant to Lexington/Trenton. For some locations (i.e., Shaw No. 1 and Starvaggi No. 1), we observed a “funnel” pattern in the BRo% data when plotted against depth – in other words, a wide range in BRo% values was recorded in shallower formations, and more similar BRo% values were measured in deeper formations. The large range of values in shallow formations seems to artificially raise the mean BRo% values in some wells, causing shallower formations to appear more mature than deeper formations. We observe no strong correlation between bitumen reflectance and mineralogy, GR log signatures and/or TOC analyses. In some wells, variations in reflectance coincide with changes in one or more of these parameters, but in others there does not appear to be any relationship among the data. In the PA Dept. of Forest & Waters Block 2 No. 1 (Erie County, Pennsylvania), the highest reflectance values occur near the Utica-Lexington/Trenton contact and do not coincide with any mineralogical changes. By contrast, in the Shade Mt. No. 1 (Juniata County, Pennsylvania), the highest reflectance values occur in the Point Pleasant, near its contact with the Lexington/Trenton Formation, and coincide with increasing quartz and clay, and decreasing carbonate. In the Marshland Unit No. 2 (Tioga County, Pennsylvania), the opposite phenomenon occurs; here, increasing BRo% coincides with a notable increase in carbonates and a decrease in quartz and clay. In two locations (the Shaw No. 1 of Warren County and Starvaggi No. 1 of Washington County), we observed intervals of higher and lower reflectance scattered throughout the entirety of the sampled intervals. In both wells, the number of measureable macerals (N) increases near the Utica-Point Pleasant contact and even more dramatically at the Point Pleasant-Lexington/Trenton contact. In the Starvaggi No. 1, where TOC data were collected, this increase in N coincides with an increase in TOC. Various sources of error can impact bitumen reflectance analyses. Bitumen can be altered by weathering to produce a mixture of less optically unaltered migrabitumen (i.e., solid oil bitumen), minerals and coke from bitumen (Jacob, 1989), making reflectance analysis increasingly difficult. Additionally, as maturity increases, more or less intense optical anisotropy and mosaic texture may develop (Jacob, 1989). For this reason, some studies (Jacob, 1989; Landis and Castaño, 1994) use only the lowest reflectance distribution when assessing the relationship between vitrinite and bitumen reflectance values. Landis and Castaño (1994) distinguish among the three optical forms of hydrocarbon, illustrating how histograms can be convoluted if the distinction is not made among the types. Further, Landis and Castaño (1994) derive “errors” in previous reports of correlation (Jacob, 1989; Riediger, 1993) between BRo and Ro studies due to a lack of indigenous virtinite, mixing of locally derived and migrated solid hydrocarbon, mixing of morphological types, limited maturation range and use of suppressed vitrinite data. Thermal maturity analysis by way of reflectance microscopy requires a sufficient number of measurements on organic macerals to provide reliable data (~50) (Schoenherr, 2007). In most cases, however, the Utica/Point Pleasant rock cuttings available for this task provided less than 30 macerals of sufficient size per sample. Conodont Alteration Index (CAI) is a well-known technique used to evaluate the level of thermal maturation in source rocks. CAI is based on color changes seen in microscopic-sized fossil teeth from the remains of eel-shaped chordates. These fossils are highly resistant to weathering and metamorphic temperature regimes and contain trace amounts of organic matter. Their color alteration is both time- and temperature-dependent and is a progressive, irreversible condition, making them ideal for correlating to maximum temperatures (Tmax). The CAI can be determined by comparing samples against a set of conodont color standards. Using CAI thermal maturation indices, the oil and gas windows are in a gradational boundary. The onset of oil generation is placed between 1.0 and 1.5, and the limit of oil generation is between 2.0 and 2.5 (Harris, 1979). Dry gas is generally associated with CAI values in excess of 2.5. The CAI data presented in Figure 7-30 is based upon a published report by Repetski and others (2008), as well as measurements for 10 additional wells collected as part of this Study (Table 7-19). These data illustrate an increased maturity basinward, similar to the isoreflectance maps of Figure 7-20 and 7-21. 7-19. Conodont Alteration Index (CAI) measurements performed by the USGS for this Study. Figure 7-30. Map of CAI data for the Upper Ordovician shale in Ohio (modified from Repetski and others, 2008).